The lab thanks Lesly and Gurbinder for joining us over the summer, as CRUISE program interns. We learned a lot from the studies they carried out and wish them the best of luck in all their future endeavors! The HPC Garage is back from Seattle / Bellevue, where we participated in the AMD Fusion Developer Summit. Rich gave a panel talk, which previewed some of the lab’s on-going work on algorithm-architecture co-design (PDF slides). Also, the HPC Garage band, “Casey and the Bloodhounds,” made its debut. YouTube video forthcoming, so stay (performance) tuned! 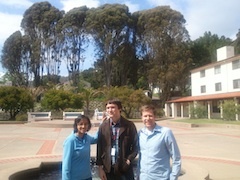 Casey, Kent, and Aparna are back from HotPar’11, where they presented our work on balance principles for “co-design.” Update: Slides posted (see below). Enjoy!